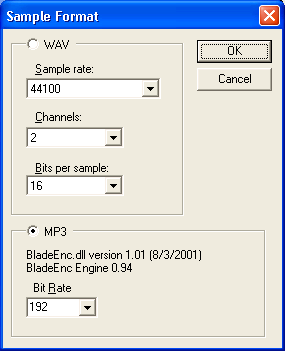 From version 1.3 of OpD2d, it's possible to use BladeEnc.DLL to record direct to an MP3 file. Important: Because of various copyright and patent laws (thank you Fraunhofer/Thomson), we can't include the compiled version of the MP3 encoder in the OpD2d installer. However, it is very easy to find. For instance, you could try here: http://www2.arnes.si/~mmilut/BladeEnc.html or here http://bladeenc.mp3.no/skeleton/DL.html. Once you've downloaded it, uncompress it and put the resulting BladeEnc.dll file in the same directory as OpD2d.exe. If everything is OK, you should see a version number here. Also, if you select MP3 in the format dialog but the DLL is not available, you may see the error message "Could not load MP3 encoder".